What is life... aliveness... to be alive? Such a fundamental idea you´d think the masses of research on life sciences would have a firm handle by now. But with ever more extreme living environments on this, our own planet, being discovered and even more freewheeling envisioning of what extraterrestrial life might be like, the goal seems to get further out of reach. Is it possible science is ignoring something fundamental? Is it time to look under the rug? Science history reveals cycles among scientists of increasing smugness leading to bursts of upheavals from the resurrection of rejected ideas. Some speculate that the promising ideas are incubated in fiction/fantasy and developed there for the minds of the next generation to consider without prejudice. In fact, maybe our medical systems and treatments are so twisted and extreme because this missing piece in our understanding of what makes ´life´ isn´t there to keep researchers from rigging misbegotten solutions. Maybe our devotion to professionalism, with its attendant and omnipresent focus on preservation of status, both economic and theoretical, is blinding our search. With little participation and respect for the potential of others, our professionals deprive themselves, and necessarily the society that depends on them, of ideas leading to the magical paradigm shift. As any mother will tell you, the most amazing reorientations come from the mouths of babes and innocents. Maybe it´s time to relinquish our ingrained habit of dependence on professionals and learn again what it takes to be in charge, to rediscover what we are capable of as our first recourse. If we consistently allow professionals to take control, rewarding them with ever greater allotments of treasure and subservience, we will be totally compartmentalized and deskilled, no one even imagining themselves attempting anything but his or her narrow, designated array of tasks and totally ignorant and frightened when socially misregulated skills with higher status are unavailable or out of reach. In a recent adventure, we learned we reverenced veterinarians far too highly, that life and nutrition are not simply chemical, that deskilling of their clients is preferred by professionals more than client wellbeing, and that you can hold the answer to a professional´s bewilderment in front of their eyes with no effect. And on the positive side, that you can figure out how to take charge and find your way through even life and death situations. On Sunday May 19th of this year, we took one of our cats -- Foxfire -- to the well-cat clinic at our local PetSmart for the vaccinations that his vet, the sponsor of the clinic, had notified us were needed. This may have precipitated the most miserable sequence in our -- and our cats´-- lives, from which we are just recovering three months later. On the other hand, like all adventures there were learning experiences and confirmations that shape the new reality where we emerged, maybe stronger because of the sense of guidance as we were launching ourselves in each crisis... And because there were at least a couple mysteries we encountered, maybe more, hopefully writing this now will capture enough of the details for the full picture to crystalize. These puzzles put us at odds with the established medical wisdom and seem to open a view of insufficiently explored territory. Come see what you can see, beginning from the beginning... at the vaccination. Although it was a well-cat clinic, we conservatively kept Foxfire in our laps or in his improvised carrier for the duration of the wait in the clinic so his contact with anyone or anything but the vet and her assistant was avoided. And though the ordeal of the shots was unpleasant,we returned home thinking we had been careful and responsible pet guardians. Foxfire had behaved admirably and though he was ticked at us, we were all glad to have come through it so smoothly. Once back home we got him settled back into our routines. At the moment our home is divided into sort of territories, with each cat -- there are three, Shadow, Butterscotch and Foxfire -- having his own window areas, litterbox, water/cleanup area, foodtrays and toys. This came about when we adopted Foxfire last year and discovered that his earlier history in the wild before neutering and immunizations would necessitate a lengthy introduction period. To alleviate potential boredom and to utilize the one larger play area with each cat, we periodically rotate our cats to one another´s territories. Being indoor cats, we carefully manage their exercise/play as well as socialization with our family. There are three adults in our home and we each take turns somewhat in their care and feeding, play and entertainment. That evening we switched Foxfire and Butterscotch´s areas. Butterscotch is a 7yo who´s very quiet but pernickety. He had slimmed down a little over the past year since his area no longer included the kitchen where we are frequently inclined to offer samples of food. Likewise, we had reduced the treats we had been using to reassure our pets through our first round of attempted introductions. He had adapted nicely to his territory, felt safe there and wasn´t often inclined to want roaming privileges, as much as the younger cats. He was even occasionally more playful than his dignified self. Since we were not performing some sort of experiment, the exact timing of the first incident is somewhat vague, but within a day -- max two -- Butterscotch had a severe bowel release. It was severe in the sense that, not only had this cat never had any loose bowels before, but his stools were uniformly on time, very solid and formed as well as identical in appearance. Never had this cat ever missed the litterbox since his acclimatization to our original household arrangement with just Shadow as his companion. Once these two had been introduced to one another, they accepted one another´s presences quite tolerantly. Within a few hours of cleaning that mess -- gelatinous and unformed -- he vomited. We thought he was upset over the fuss and upheaval, thinking it was a scolding for the mess, and expected the problem to disappear with some attention and his favorite treats, namely some wild wheat-like grasses. He was eager to eat grass and we thought the unpleasantness was over. What we didn´t notice right away was his rejection of other foods. We keep foods in our cats´bowls so that they can eat whenever they wish and simply refill them whenever we notice that they´ve finished their usual supply. He was a fairly light eater, being less active than the younger cats, so it wasn´t uncommon for his bowl to be skipped when checking for refills. When we saw that he had lost his appetite, we began trying to coax him with treats -- unsuccessfully, except for ´grass´. I had read about dietary research for pets that paralleled our semi-vegetarian diet, including one study of how raw foods were much more beneficial to cats, even though their food processing systems were geared for meat so his remaining preference for greens was significant to me, particularly since I had been trying to figure out how to implement some transition. He had even shown an interest in mustard greens. Everything else was as routine as could be, except for the trip to the vet. I knew some friends a while back who never vaccinated their pets -- or their children for that matter -- but I had thought that the hazard was allergic reactions and since the cats had no problem with their first vaccinations -- to our knowledge -- and since we updated our tetanus shots for ourselves, it seemed fair and logical to update our cats´shots. Yet this was the only other event or contact that was out of the ordinary -- external -- and I went to pursue information online, searching for the hazards of vaccines. What I found was a page at the holisticat.com website by a homeopathic veterinarian that boggled my mind. The hazards were much more profound and even standard veterinary textbooks were quoted which, to my mind, incriminated practicing veterinarians for promoting fears in order to sell their services with these vaccines. Most significantly, the description of panleukopenia -- one of the shots Foxfire had been given -- matched Butterscotch´s symptoms in many ways -- and as things progressed, has matched them completely -- especially since there apparently was evidence of this vaccine inducing chronic symptoms of the disease it was claimed to prevent. There was even the suggestion that a "killed" virus -- the basis for this vaccine -- was paradoxical since a virus is somewhere between alive and dead by nature anyway. How dead is a virus? Had we exposed Butterscotch to a not-so-dead virus the vet had injected Foxfire with? There was even a sort of correlation between one puzzling twist in his behavior and the article´s section on the titers in an immunized cat´s blood. According to the research on immunities, these titers that fought the disease vectors in the cat´s system could become dormant like firemen playing cards at the firehouse but would rouse to an alarm within 48 hours. In the period when we were simply coaxing Butterscotch -- pretty unsuccessfully -- to eat, we mistakenly thought we were out of the woods when, one night fairly near the beginning of the ordeal after I had changed his kibble brand for a new flavor, he had rather enthusiastically eaten some at one opportunity but never resumed eating after that. Could his immune system have kicked in to wipe out the invaders, only to have taken too long before other damage was in progress? How would we effect healing? At first we thought maybe our cat´s natural tendencies to eat only greens and to drink large quantities of water were the guidance we needed to support but we lacked any clues of how to proceed, meanwhile his weight loss and withdrawal were alarming and sources we contacted said his liver would be damaged if he didn´t eat. The idea of taking him to "our" vet was totally repugnant. How can you even consider entrusting your vulnerable precious cat to the very same sort of person who was responsible for this terror and misery? Particularly when they not only violated their moral responsibility to advise us of the hazards they were inflicting -- and should have known about, -- but they even insisted that there were no side effects when we had asked. Some have told us that veterinarians are legally bound to inform their clients before the decision and the article suggested that the failure to do so showed an unconscionable predilection to line their pockets with lucre using their fear mongering messages to pressure pet guardians to show up. I joined the listserv at holisticat and queried their ideas. We had already begun trying to "push" yogurt in order to stabilize his intestinal tract, thinking that that was the key. But delivery was messy -- using the pill-popper with crushed kibbles as thickener -- but we desperately needed to improve since he was now refusing even the greens so we were chopping them in too. Force feeding is a demoralizing effort. The diarrhea-like event did not repeat but his bowel movements were less than normal -- though likely appropriate for the small volume -- and his urine output was substantial, to match his fluid intake somewhat. Fortunately, we located a holistic vet since the listmembers were advocating bloodwork to guide treatment. The holistic vet was located almost in the next state, a good 45-60 minute drive depending on traffic, weather and route. Butterscotch was more hopeful that day than he had been for a while, actually purring through the drive and the exam. The vet noted, in addition to his obvious weight loss, some hepatic anomaly through feel, severe jaundice inside his ears and the inner eyelids, as well as considerable tartar on his teeth. He wanted us to authorize a biopsy of Butterscotch´s liver but we were resistant to this idea for several reasons. First, the stress of the procedure would logically be strenuous and overtax Butter´s weakened condition; anesthesia, ultrasound, surgery are hardly good for the patient. Second, even if it showed some viral/bacterial damage the main treatment was nutritional anyway and bloodwork would give similar clues. Thirdly, his suggested causes of the problem that he wanted us to worry about did not match what we knew -- and had told him -- of Butter´s history!! In addition, given the history I had observed, there was the distinct, substantial likelihood that the problem now was strictly "primary hepatic lipidosis", meaning that the liver damage had no other remaining underlying cause to hunt for with these invasive procedures!! The vet declined to offer any estimate of the likelihoods of various outcomes for our choice or its alternative, saying there were too many unknowables and though he advocated for the biopsy, saying that Butterscotch was "still responsive and alert", he agreed to offer assistance with a nutritional approach. He prescribed Denosyl SD4 which he said was a promising liver treatment also known as SAM-e, and a nutritional supplement consisting mainly of various organ parts -- liver, spleen, kidney, &c, -- as well as some silymarin, which I had specifically requested information on appropriate use for cats. I also requested a syringe to attempt to make our feeding more effective, but I turned down alternative foods since I felt Butterscotch was more likely to be receptive to familiar foods. The vet took the blood samples that he said he needed and said we should return in a week for followup testing. The next day when we received the bloodwork results, there was indeed no sign of problems other than extreme distortions in the bilirubin and the alkaline phosphatase. Both were off the chart. At 18.68 the bilirubin was the highest he had ever seen or heard of, but when asked if the titer counts had indicated recent exposure to the panleukopenia virus, he explained that he hadn´t arranged for that test because you would need a "before" and "after" value to establish causality, and that the test would have required a lot larger sample to be sent away to Cornell. (This certainly raised the question of how veterinarians -- still attempting to validate *some* use of these vaccines when confronted with their hazards -- could seriously propose using this titer measurement as a basis for deciding on whether to re-immunize outdoor pets and indicates how pernicious a risk this shot-propensity really is.) His only other nutritional advice was to avoid too much fat in Butter´s feeding since it was a cat´s inherent difficulty in processing fats from his body´s reserves to cover his daily needs while not eating that had resulted in the toxic levels of bilirubin accumulated in his liver. That week the experimenting with methods and adjustments to foods continued. Among our discoveries, we decided that the best delivery method for pudding-like foods or liquids was an ordinary kitchen baster, though it was not without problems. The syringe, by contrast was made for alcohol-based fluids, was unpredictable in its stubbornness or suddenness, and the necessary pose was repugnant to a caregiving mindset. Compared to the digestibility of the pudding feedings alone, simply dipping Friskies in the pudding-like supplement-mixes, was fairly efficient as a mechanical, doable process but it ran into a wall of especially limited digestibility --his injured digestive processes would not clear the way for adequate feedings with these foods. The inadequacy assessment was based on the amounts required for sustaining his weight at the very least. Small feedings were necessary because of the stress of force-feeding but this increased the required frequency. Still the total daily requirement was nowhere near doable because his system couldn´t handle even this more grazing-like pace. This was apparent because he would throw up what exceeded his ability to digest from the previous feeding when we began the next feeding. The Friskies were just too difficult to digest and blocked access to his digestive system for any other foods. They were there undigested. Exit that option, enter more raw foods. The original egg and yogurt combination was nutritionally good by the numbers and was digestible, but delivery was complicated. The baster was not the problem; the problem turned out to be that Butters not only dislikes yogurt but can detect it pretty astutely inspite of the supplements like Missing Link, potassium aspartate, magnesium aspartate and canned cat food, mostly Sophisticat. If he was able to detect the yogurt, the pudding-like feeding would be messy, one more thing Butters, nor we, could adequately cope with. The other issue was his drinking water. The lengthy periods Butters spent getting his muzzle soaked while drinking from the bathtub faucet -- his exclusive choice of method to stay hydrated -- as well as any lingering traces of the errant foods, were doing damage to the fur on his cheeks, especially on the wettest side. My son daubed vitamin E on the sore skin and in a couple days the skin looked more normal though devoid of fur, sigh. We settled for egg only as the base for the supplements and introduced raw meats. This step, with its visit to the grocery meat morgue, was a bit daunting but frozen fish was a natural choice, packaged as filets for ease of thawing small amounts. Breaking apart fillets and defrosting a day´s amount, then snipping it into half-friskie size morsels with a serrated shears -- appropriately cleaned from my kitchen tool bucket -- prepped a digestible, deliverable and fairly cat-appropriate meal, one that I could repeat quickly for each of the other two cats. Although Shadow and Foxfire eagerly downed the saucerful, my daughter was the skilled -- and brave -- handler to feed Butters, deftly opening his mouth, rapidly slipping the morsel against his palate, evading tongue and teeth, and cradling his head while he chewed, feeling for his swallow. My task was to encourage him and to ´remind´ his paws to stay out of the action as he curled up in the oval sink basin, his chosen venue for the process which fortunately was also a suitable working area. The second blood test showed only a modest improvement in his liver results and his weight was almost steady but the real shock was discovering that we had to schedule the test a day early so as not the run out of the SAM-e and being told that the reason the vet hadn´t ordered us a full box was that he didn´t expect Butters to last a week!! Clearly the vet´s earlier claim to inability to offer the information we requested on likelihoods was either disingenuous or he was untrained in expressing his expert´s gut feeling. When I examined our decision analysis charts on our initial dilemma, it was clear that he not only didn´t give any credence to our account of the events leading to Butter´s illness, but his assessment of our ability to carry off a nutritional solution had to have been 20% or less, something clearly more definite than his plea of too many variables. But that was not the only thing we weren´t told though I specifically asked about side effects. ´None´, is what I was told. In our research on this SAM-e, we found out that when it was given to humans there was a serious need for supplementation with B6, B12 and folic acid lest the metabolism of the SAM-e solving one problem would cause the accumulation of dangerous amounts of homocystein (?). Since we had no comparable data on the Denosyl, we opted to cut some of our own Bs down proportionate to the ratio between Butter´s weight and the "average" adult. The vet later confirmed our estimate but only continued to push for standard veterinary "science diets". When questioned on their benefits, the response was that they were processed to be very "fine" for easier feeding. We tried one can only but discarded that idea since it required the syringe with which by that time we were totally frustrated. Based on its main ingredient, after water, being liver, as well as my daughter´s success in feeding Butters the fish nibbles, we decided to venture once more into the meat department in search of liver, preferably frozen and apportioned somehow. If we were going to engineer a cat´s normal sort of prey for Butter´s diet, then the recipe should have some internal organ meat to complete the muscle meat, and liver seemed like the right candidate. Now this was getting into areas of concern that fish, being a wild animal, didn´t have. The irresponsible use of hormones and the overuse of antibiotics in the cattle business make these meats, as well as milk, difficult to navigate, so I was somewhat relieved to find calf liver in the frozen sliced form I was seeking. It seemed less likely that a calf would have been exposed to as many of these hazards, all of which would be more seriously concentrated in the animal´s liver. By the time we approached the third blood test, we had Butters´s diet completely converted to fish, egg and liver, plus his supplements and SAM-e. Persisting with our nearly-around-the-clock force-feedings, we finally saw some fantastic changes in his condition. We were celebrating the re-emergence of his old self on a few occasions in the two days prior to the impending office visit, -- showing some tentative interest in being inquisitive, carrying his tail higher and licking catnip from my son´s fingers. There were definite changes in the yellowness in his ears and eyelids. He didn´t seem quietly angry when he was tired, a typical symptom that homeopaths look for in liver problems. But more amazingly, we were gaining these signs of progress because we had found the rawfood loophole. Although the quantities we could feed him without stressing his tolerance and his liver´s limited ability, though better than with other diets we had tried -- no more throwing up undigested foods --, would have still seemed discouraging based on the diet´s calories compared to the standard nutrient-chemistry in the textbooks, he was no longer losing weight!! The standard textbooks specify 30 calories per pound of your cat´s weight and Butterscotch was a 10 pound cat so by those standards he would need about 10-12 ounces of meat 'n' eggs. But his body could handle only the 5-6 ounces of raw fish, liver and egg spread out in one ounce sessions and that was sufficient for him to make progress. The rawfood loophole, the fact that there´s more to raw food than calories, was the key that was saving him!! The unconventional rawfood research with its Kirlian photos and personal stories, on whose basis we had begun transitioning to raw vegetarian diets ourselves, had claimed that there is no life in cooked and overprocessed foods in general but there is in raw, which was being confirmed before our eyes for carnivore fare as well. According to our rapidly expanding reading of the research on raw foods, the calorie requirements using raw foods were between 1/3 to 1/2 the requirements using cooked. The experiments feeding these low caloric diets to people had to be terminated when the foods were cooked because of the emerging signs of detriment, but the same diet uncooked was successful to completion. We even saw this in Shadow´s and Foxfire´s response to the introduction of raw portions into their diet. Their chosen supplementing of the raw with freely available Friskies dwindled calorie-wise much faster than we were adding raw food calories. There was something very powerful to nutrition besides calories, vitamins and minerals.. and we had succeeded in tapping it. What were those energy halos in the Kirlian photos? Was this energy medicine? The magic was palpable and mind boggling. But the vet was unimpressed by our observations, preferring his simplistic temperature and weight measuring even though the day was very hot and our trip to his office exceedingly long so that Butters was a little stressed. Maybe sensing the doctor´s less than appreciative attitude for our little group´s valiant efforts and nascent triumphs, Butters really gave the medical team a demonstration of his displeasure with the blood drawing exercise. Snarling and hissing like we´d never seen him do before, he jerked free and ran to my shelter and we left without lingering over much except the process of trying to straighten out the anomalies in our bill. The results of the blood testing were confirmation of our progress though there was still a long way to go. The total bilirubin was now down to 6.8, still ten times higher than it should have been to be considered normal. Our improvised use of potassium aspartate, balanced with magnesium aspartate, had brought his potassium levels up a little closer to normal. The alkaline phosphatase was almost right on the high-normal end. Now we were to continue for a couple weeks again before another blood test, but I was beginning to wonder if our knowledge of Butters normalcy wasn´t a better indicator. The white blood cell count had risen now a little above normal and he was still a little anemic, but even some of the blood results, like albumin, could have been influenced by the hydration limits inherent in our trip to get to the office. I asked the vet about the dosage on the SAM-e since the package directions, which I now had succeeded in getting a copy, said the dose the vet had prescribed was double the normal dose. He acted somewhat taken aback but said we should begin the normal dose for the duration. The feeding of the fish or liver nibbles was going more smoothly and we relegated the baster to after-meal hydrating to relieve Butters of the need for extended faucet time. About an ounce of water after each feeding session. All foods were now finger fed and we were delighted the day Butters eagerly licked his saucer of raw liver bits clean down to the shine, while we all stood around breathlessly smiling and hoping this would soon be a reliable, repeating pattern. Now my son or I could possibly give Butters an extra feeding when my daughter was getting some rest or one of us needed to go somewhere for a few hours once in a bluemoon. Otherwise, we dried out the bathroom sink basin and did our routine operation, from pampering his poor little cheek skin, to grooming his coat, to clearing the goopy stuff out of his eyes, interspersed with feeding and hydrating. The goopy stuff had been diminishing now to just the simple sleeper removal instead of the much thicker sticky, ropy discharges my daughter removed at the height of the dilemmas. We thought we were on the way to the end of the tunnel. Any day, any day now, what day would it be. In the back of my mind was the vague warning in the books about humans transitioning to raw food too rapidly. The hazard was related to the detoxing process which re-ignited old traumas for proper re-healing faster than the body could clear away the detritus. When I had begun my own transition to rawfood, I had been cautiously gradual but with Butters we had no choice but to convert as quickly as I could. My own detoxing had been very mild considering my list of past troubles but we had no idea of Butters´history for those first four years before he began frequenting our former home back in the city. No idea at all until late at night about a week after the third test. We had brought Butters into the bathroom and while I was positioning him in the sink I noticed a spiky place in his fur about midway between his shoulder and the back of his lower jaw. As soon as we finished the feeding, I proceeded to examine the sticky fur before starting to groom him. My daughter commented that it looked pinkish so I used a tissue to begin cleaning it but there was more of it deeper in the fur and as we spread our way to the skin it was apparent that he was bleeding! Not only was the blood coming as we disturbed the fur, but the adjacent area looked purple for about an inch around, setting off alarm bells. The vet´s answering machine routed us to an emergency clinic about a half hour away, but there didn´t seem to be another any closer on our side of the city. We held sterile gauze pressed to the bleeding site, got specific directions, bundled everyone back into street clothes and took off, only stopping a moment to add a gallon of gas to the unfortunately near-empty tank. The late-nite road construction crews were luckily not a delay and we made good time. I started to explain Butters´ history as soon as we arrived at the front desk but the staff simply insisted on taking him away into the examining area, without so much as a clue as to what his circumstances were! What apparent hubris! Although this didn´t bode well, we paced around for half an hour til the attending veterinary sugeon entered the waiting room to tell us that they had only shaved the area and uncovered an abscess that they felt was a bite received maybe four days prior but they were alarmed at his condition, listing the jaundice and his thinness as if it was news to neglectful owners! We informed her that we indeed were aware of his condition and that he was receiving appropriate care for these conditions, updating her on events and progress to date, while seeking to know more about the bite. We assured her that although there were other cats in the house, there was no contact between them, -- absolutely certainly -- not for the period she said was the origin of the bite. She dismissed the possibility that it was a spider bite or some such critter when we proposed other potential household invaders. Even less credibility was assigned to our suggestion that it was part of detoxing in our feeding program, yet she had no alternative to offer. The bite mark itself was not apparent, presumeably having been lost in the little piece of skin where the bleeding was coming from. Her "explanation" was that cats were good at concealing symptoms. "They masked them well." Although I´m aware that cats have a higher tolerance for pain than most people would expect, the illogic of hiding behind this excuse with nothing else to offer was absurd. It however explains why science cannot deal with what it fails to "see". You can´t study something you refuse to notice, blaming the patient for "hiding" what doesn´t fit your scheme. If the abscess was there when she said it was, she ignored the fact that my daughter and I were handling Butters several times a day for each of those three to four days, doing a bit of his grooming after each feeding, especially around his face and shoulders. Did she possibly dismiss our observation skills as being "untrained" or worse, thank you? Assuming she was not questioning our truthfulness in asserting that Butters could not have been bitten recently because our cats were in totally separate rooms, only our observation skills while handling him, then at least the ´bite´ had to have been there longterm. Not only was she thus dismissing my observations and personal research but this excuse questions her own medical colleague´s work and makes the consultation of a veterinarian useless. The holistic vet had examined Butters less than a week ago, and twice before within a couple weeks´time. If it had been there then, Butters must be a wizard at hiding an abscess that size or even a bite wound sufficient to cause such an impending abscess, especially since the vet was groping Butters very thoroughly for any sign of abnormalities, sources of infection or changes all over his little body on three separate exams!! Further, no sign of such an infection appeared in his bloodwork, except for a slight rise in his white bloodcell count to 21.5 in his third test compared to a normal high of 19 and an 18.1 in his second test, an 11.3 in the first!! A classic invisible bite, no scar, no nothing detectable by a medically seasoned veterinarian doing three separate full body exams within the period immediately preceeding the date as well as two rounds of bloodwork with only the slightest rise in the infection signal as we begin feeding Butters rawfood in earnest when this invisible bite decides for no reason at all -- certainly not something as unfamiliar to this specialist as detoxing which has no pedigree as an idea to her, regardless of how many individual reports of anomolies are recorded by non-establishment sources in similar situations -- to suddenly balloon up into a 2 inch diameter, pus-filled, bleeding abscess. Capriciousness she finds more believable than detoxing. Of course, I should trust traditional veterinary sleuthing after such a demonstration of prowess! Neither she, nor the tech we spoke to afterwards showed any signs of acknowledgement that detoxing was the key to their capriciousness dilemma. In fact when the idea was presented the veterinary surgeon seemed to blank momentarily as if she was waiting for us to say something, then she picked up her line of thought as if nothing had been said. Nevermind, they just wanted permission to drain the abscess, would prescribe anitbiotics to reduce the infection and instructed us to put very warm, wet compresses on the bruised area for 15 minutes, twice a day. They claimed that the flat little pocket of remaining blood -- about 1/4 inch wide and 3/4 inch long -- would be resorbed by his body in the added circulation caused by the hot compresses we were to apply. Apparently they considered the bruises to be at least a couple days old to allow time for the abscess to have formed, otherwise it seemed to me that cold compresses would have been the needed care for a bleeding bruise, pus-y or not. The skin was expected to turn black and eventually slough off. We took our little Butterscotch home and had a thorough look at his wounds, finished his routine for the day and called it a night. On a hunch that this absurdity needed to be seen to be believed, we took a few photos of his wounds. The next day we began implementing their instructions and called the vet to update him. Having a busy day, he waited til he had seen the report from the emergency care unit before returning our call. By then, it was clear to us that the pocket of blood was becoming larger instead of being resorbed. The vet said we should continue the prescribed practice for the weekend and if things weren´t better by Monday, we should bring Butters into the office for more ´work´. Our suggestion that we should drain it was dismissed with an obvious shudder. On Saturday, the situation was not improving but getting worse. The pocket was now about the plumpness of my thumb and the thought of doing this to Butters for another day, only to have the vet find it necessary to do something even more drastic by Monday was just unacceptable. 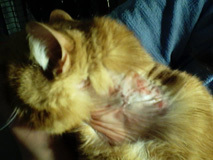 I called the vets at the emergency care unit on the premise that it was their instructions and they had seen the wound. Again the instructions were to continue inspite of the report that it was making the bleeding worse. But I pressed for more information on alternatives and suggested that I just might drain it myself using the example of how I´d drain the fluid from a blister with a sterile needle. The emergency vet on duty, began to take my intentions seriously and explained some of the caveats, -- or was it throwing up obstacles -- like needing a large size needle for any more pus -- of which there seemed none, not a problem -- and the warning to be careful not to puncture the new inner skin that was trying to form -- which I decided could be avoided by holding the needle parallel to the cat and entering the pocket from the side. When she said the new skin needed to be drier to heal, it seemed unconscionable not to attempt the process. I reasoned that I could do this -- assuming my daughter could hold Butters steady -- by sterilizing a modest size safety pin, using a poultice of mashed plantain leaf to seal the puncture and hopefully the inner bleeding opening, and relying on the antibiotic -- which Butters had no noticeable unpleasant reactions to -- to prevent any further infection. Not only did my daughter have no trouble holding Butters, he seemed almost relieved. I pressed the pin into the side of the bubble-pocket, using my opposite thumbnail for it to prick as it emerged out the other side. With a supply of tissues to absorb the thin, bright red liquid, we pressured the bubble til it was a fairly flat, flabby pocket. Then we covered the entire site with the plantain poultice, holding it there for several minutes, before drying and cleaning up. For the next couple sessions, we switched to cold compresses, which Butters accepted easily, whereas by contrast the hot ones he attempted to escape. Even though we needed to repeat the process on the following two nights, we felt a sense of success. Not only was the bulging hazard fairly obviously and progressively being reduced so that each day´s problem was slightly smaller than the day before but Butterscotch´s new inner skin was getting at least some opportunity for healing instead of sitting soggy in blood the whole time. After that we began monitoring the shriveling, blackened outer skin, using the usual logic of treating the bruise and dead skin, only switching from an oil-based plantain compress to a purified water-based plantain poultice whenever he scratched some of the scabby loose. We tried various bandaging schemes and even spritzing colloidal silver on the opened scabs to clean them but he seemed to enjoy the game of entertaining us with misplaced bandages. 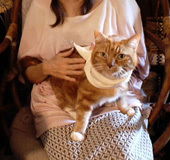 The most successful bandage, the one which he tolerated the best as well as protecting the scabs the best, was an old socktop of my son´s that he wore like a turtleneck collar, while his scratching only broke the scabs into a less pinched, more divided pattern, more like a scuff. Meanwhile, we began adding substantial amounts of minced wheatgrass from our weed patch to his raw fish, liver and egg. The grass with its true chlorophyll, not synthetic chlorophillin, was known to be particularly good at detoxing and regenerating liver cells. Once these were a consistent part of his feedings, the pace of his improvement seemed to pick up and my daughter could retire from being oncall for each mealtime. Butters gradually not only ate his servings whether fish or chicken or liver or some combination, but he began to relish the act of eating. He was still drinking copious amounts of water, but from a bowl, and lingering over an occasional ice cube or two floating temptingly as a treat. Within the battle of the bandages period, Butters became downright cheerful, sometimes dashing like a bunny and bounding into our laps to tell us he was hungry. With the return to self-grooming, a lot of the old fur began to fall away and for a while we had to comb him a great deal to prevent him from ingesting the makings of hairballs. It was somewhat distressing to see even more fur come out around the shaved area but eventually the new fur emerged, bright and healthy. Gradually he´s gaining a bit more weight and padding though it´s not diminishing his verve. Even Shadow, whose occasional but repeating eye infections had been pronounced as longterm incurable by the cat specialist we´d taken him to, has not had a single re-occurence, his immune system now successfully dealing with the hepatitis. So every morning we fix a days´worth of feedings for our cat tribe, dispensed throughout the day about every 5 hours, which they await with eagerness, and we are reserving the kibbles for comfort food for Shadow and Foxfire, basically only when it´s bedtime for the humans in our household and to slow any rapid detoxing. Now we´re developing our own rawfood nutrition habits, custom to our simple lifestyle and tastes.. In the meantime, while following the stories of newcomers to holisticat´s community of refugees, we´ve heard of vets with another mistaken treatment leading to crises like ours, namely inducing guardians to put their cats on low calorie diets because the standard defective dry and canned diets have made them overweight. These even worse foods, with their even emptier calories, are inducing exactly the hepatic lipidosis dilemma, which these vets then treat with a range of extremely invasive feeding tubes and exorbitantly expensive hospitalizations because the poor cat´s owners can´t cope with the ravages of HL, given their work schedules, their induced helplessness and their available cashflow. How utterly blind. Buyer beware of disdainful, self-serving stupidity, at best, in sheep´s clothing. You can do better. Don´t allow yourself to be deskilled by anyone´s assumptions. Based on our experience, we suggest that you find a group like holisticat´s observant, savvy guardians and caring, openminded veterinarians, technicians and handlers to cope with the very unpredictable events, and answer the myriad, individualized questions that you will need to pose for your cat... from whether to grind or not, to which bones to feed (chicken necks are softer, grinder recommendations) as you engineer your cat´s inhouse prey, to the meaning of and methods of solving their special symptoms and behaviors, all the way to which tests to get from your local veterinary provider, what you need to know about wider alternatives and second opinions for your existing dilemmas. Holisticat has an archive (http://www.escribe.com/pets/holisticat) you can search and the size of the group -- which was still very productive and community-feeling -- was about 500 in number, large enough to cover a wide knowledge base and just barely small enough to not be overwhelming with a digest of daily mail and dilemmas. Then we can all share what we know, have tried, have seen, as well as get answers ourselves so we can be the guardians we seek to be for our cats.